I can’t tell you how many times I’ve been shut down while trying to talk up the merits of a front-wheel drive car. They have come a long way since the K-cars and don’t all understeer insanely. And even when they do, it can be fun with a lot of power. Of course, I try and tell this to people with WRXs and 3-series, so it’s my own fault. It’s this rear-wheel drive pressure that probably got to Alfa Romeo again. Over the weekend, there’s some muttering on the internet that Alfa Romeo is ditching front-wheel drive and going back to the rear-drive origins it pretty much abandoned in the 1990s, all in a bid to be a serious brand with serious sporting credentials. It made me think of the last time they offered a rear-drive sedan. The Milano (known as the 75 to people not in the US) gets a lot of flack over its looks and I haven’t understood quite why. It’s very wedgy with this interesting uptick towards the back that makes it look a little bent. I like it. I’m probably in the minority, though. It sold terribly over here, but this 1987 Milano Gold is one of the nicest I’ve seen in a long time. The recipe for the Milano Gold is a pretty good one, with a 2.5-liter V6 in front mated to a five-speed manual at the back and sending power to there, too. It’s also compact. I seem to remember these had tiny trunks. The interior is in great shape for a 26-year-old car, but I don’t think it has the style typically associated with Italian models. Where are the cool dials you used to get on Alfas? That’s really minor quibbling for a car that’s very uncommon and, I think, very underappreciated. It’s an old Alfa, so it’s going to be hopelessly tricky to maintain, although I do recall an Alfa fan saying his Milano was the most reliable Alfa he’s ever owned – whatever that means. 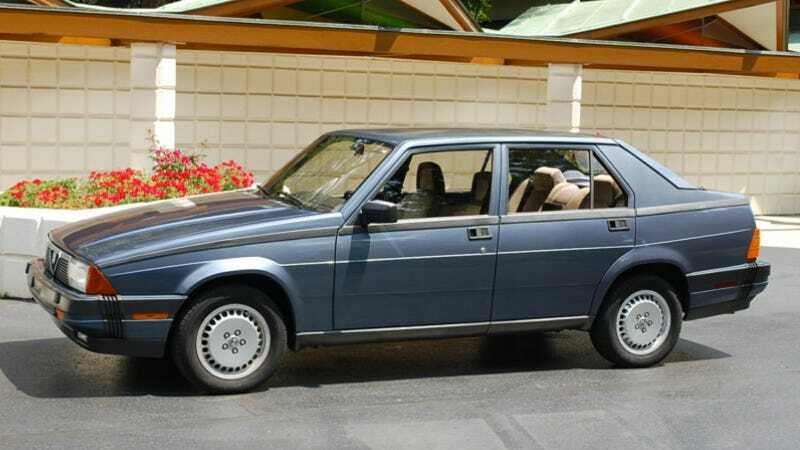 There’s another fast sedan from a company that decided to go all front-wheel drive after the ’80s, though. OK, this Volvo 740 Turbo SE is from 1991, but it’s the same iconic shape that was the epitome of squareness. And in this situation, it has one of the most garish bodykits/color schemes I’ve ever seen. From some angles, it makes it look like a badly modified Pontiac 6000. What was Volvo thinking in '91? The 740 Turbo isn't so much a sports sedan as it is a fast sedan. No amount of spoilers could ever make it look quick, but I’ve driven enough of them to say otherwise. It’s not a handler, but the 2.3-liter turbos pack a punch – probably like being able to sprint while hauling a refrigerator on your back. That's the great thing about 740 Turbos, though. They're just big, friendly beasts. The interior is clean and vast and those seats are comfy as hell. For midrange punch that’s likely to sway around drunkenly in corners, this is the ride. And it's fun, in its own special way. Normally, I’d be pressed to take the Swedish quirks over the better-handling car. That’s not the case here, because I’ve had such a soft spot for the Milano over the years and to see one look as nice as the Milano Gold does makes me want to open my checkbook. I know it’s rusty and lacks a turbo, but it looks special in a good way – not special in a bad bodykit way like that Volvo.